HONOLULU – The year 2019 marks the 50th anniversary of the formal opening of the Hawai‘i State Capitol. Dedicated on March 15, 1969, the 10th anniversary of the passing of the Hawai‘i Statehood Bill by Congress, the building stands unique among the other 49 state capitol buildings, proclaiming Hawai‘i to be part of the United States, but not part of America. “The Capitol – E Komo Mai” is the theme of the full-color 2019 calendar produced by the Department of Land and Natural Resources divisions of State Historic Preservation and Boating and Ocean Recreation, with the Hawai‘i Heritage Center. The calendar is designed by Viki Nasu Design Group with photography by David Franzen. 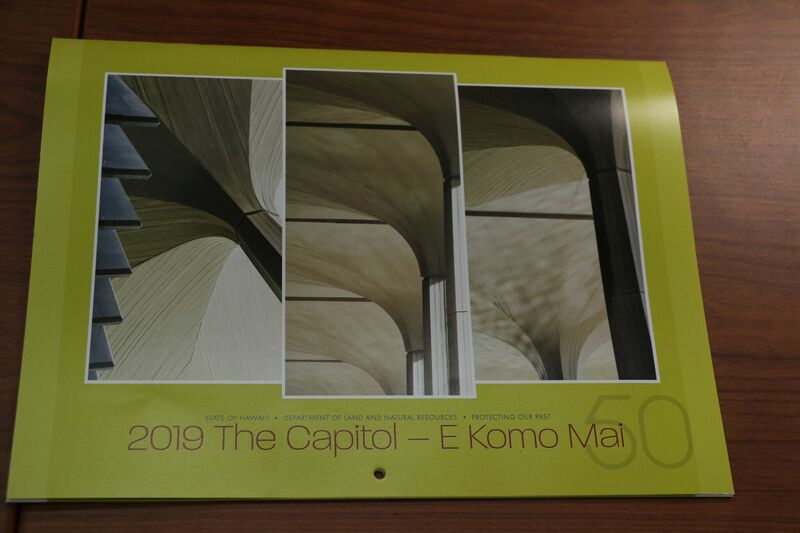 Copies of the 2019 The Capitol — E Komo Mai 2019 calendar, which also serves as a tide calendar, are available for purchase from the Hawai‘i Heritage Center, 1040 Smith St., Honolulu, or by mail at: P.O. Box 37520, Honolulu, HI 96837 or call (808) 521-2749.